Ramps are one of the simplest and most cost effective means of improving your mobility and accessibility. 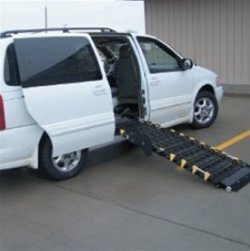 They allow much easier access to a variety of places such as up small sets of steps, over doorway thresholds, over curbs, or even into a van with your wheelchair, scooter, or powered mobility chair. G & J Enterprises sells a huge number of ramps from such well know mobility product names as Harmar, PVI, and Roll-A-Ramp. From portable ramps to vehicle ramps and even modular ramp systems for residential or commercial use, we have multiple options available to meet whatever ramp access needs you may have. 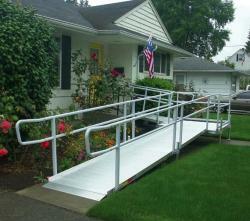 When it comes to access ramps, the variety of lenghts, widths, styles, and installations are almost endless! Our large selection of available access ramp systems certainly includes just the right solution to your ramp access needs. Curious about the features and benefits of some of the ramp systems available? 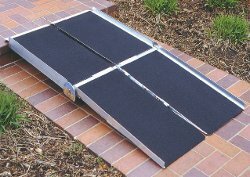 Lets take a look at just a few of the popular access ramps we sell and see how they can improve your accessibility. Unmatched strength supports 1,000 lbs. For more information, please contact one of our knowledgeable staff members. They will be more than happy to help you choose just the right ramp to meet both your access needs as well as your budget.